Elements of Quality Online Education, Volume 3 in the Sloan-C Series, is a groundbreaking study of important questions about quality in online learning from the perspectives of private, for-profit, and research university and college practitioners. What do learners like and dislike about online learning? What makes faculty happy and unhappy about teaching online? How can schools drive down costs and prices to achieve capacity enrollment while maintaining and improving the quality their distinctive missions have established? How can schools widen access to their programs by creating virtual environments that give timely and complete academic support and administrative services to build learning communities? These are the questions the Alfred P. Sloan Foundation invited educators to study in a collaborative Sloan Consortium workshop that convened in September 2001. 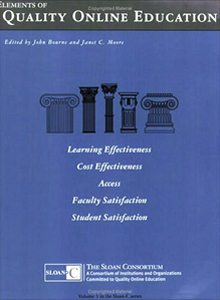 Ten peer-reviewed case studies present a wealth of inside information about the strategies successful programs are using to improve learning effectiveness, cost effectiveness, access, and student and faculty satisfaction. These elements of quality constitute the mission of the Sloan Consortium: to make education a part of everyday life, accessible and affordable for anyone, anywhere, at any time, in a wide variety of disciplines.